charmcityartsmaven: COMMEMORATE THE 400TH ANNIVERSARY OF THE BARD’S DEATH FOR ONE WEEKEND ONLY! COMMEMORATE THE 400TH ANNIVERSARY OF THE BARD’S DEATH FOR ONE WEEKEND ONLY! Join us as we slice, stab, smother, smack, shoot, grieve, poison, rend, and bludgeon our way through every death that Shakespeare staged—all the hits and all the deep cuts! Some serious, some comic, some comically serious, and some seriously comic. Produced in partnership with Cohesion Theatre Company, The Complete Deaths of William Shakespeare celebrates the 400th anniversary of the Bard’s death with a special blend of Elizabethan and Jacobean mayhem that we imagine would have pleased him. 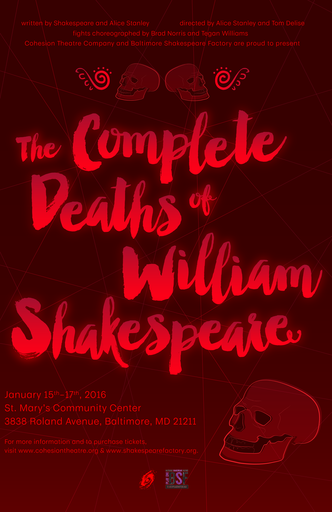 Directed by Tom Delise and Alice Stanley, with fight choreography by Tegan Williams and Brad Norris, The Complete Deaths of William Shakespeare opens this Friday and runs for one weekend only! Don’t miss it! The Bard to the Bone Society kicks off on January 20! WHEN: January 20, 2016 from 7:30 to 9:00 pm. The Bard to the Bone Society is a group that will meet bi-monthly, on odd numbered months, to informally discuss all things Shakespeare while also enjoying free wine and snacks and socializing with other Shakespeare lovers. Spirited conversations about special topics such as Shakespeare’s staging conditions, Shakespeare’s verse, the Shakespeare authorship controversy, and more. Please join us for some stimulating conversation and the chance to meet some interesting people! SVP to April Forrer at april.forrer@theshakespearefactory.com. We can’t wait to see you there!